After debuting its first Wear OS smartwatch back in 2017, Emporio Armani is back with another Connected model - this time aiming to add a bit more substance to the inevitable style. 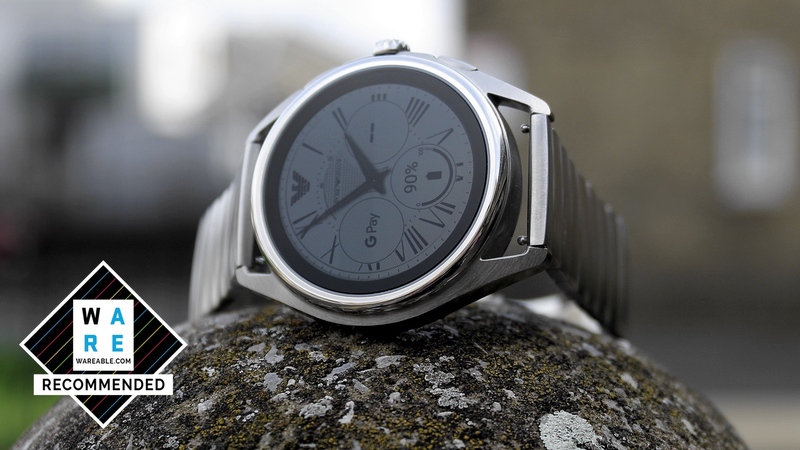 The fashion house, whose tech timepieces sit under the watch of the Fossil Group, missed the mark somewhat with the first Armani Connected choosing to leave out features such as Google Pay and GPS; all while still charging roughly the same as an Apple Watch. The price tag is still lofty, starting at £329 and rising to £389, but there's plenty more functionality on the spec sheet this time around. With its rivals also improving since Emporio's last outing, however, the bar has again been raised. Does the Connected 2018 do enough to keep up with the ever-progressing competition? We've been living with the smartwatch to find out. We were fans of the design in the debut Emporio smartwatch, but it definitely feels like things have been taken up another notch in the second-gen model. It's smaller and lighter, with the bezel now separating from the interchangeable watch straps. Our review sample was the stainless steel edition, though there's also options with rubber and leather bands to consider, as well as a gold or black bezel. Measuring in at 43mm x 49mm x 12mm, gone is the heft of the 46mm original, and the Connected feels much better off for it. It no longer feels like a dominating figure on the wrist, meaning even more people will be able to find comfort wearing it, and it can still, crucially, blur the lines between operating as a stylish timepiece and a touchscreen smartwatch. Speaking of that 1.2-inch OLED screen, it's still one of the best in the business, popping out 390 x 390 resolution (akin to the Apple Watch and Samsung Galaxy Watch) at 328 pixels-per-inch. Even if you have the brightness set to low, things are fairly crisp, and when pumped to the max, you're able to see clearly in full sunlight. Unlike many other devices, the screen can also be set to light continuously - although it does lag a tad when switching between the dimmed, always-on face and the full face when raised. Like before, navigation is performed through the two buttons on the right side of the face, acting as shortcuts to apps or things like Google Pay (yes, there's finally an NFC chip inside), while the accented crown once again looks to play an integral role in your movement. A long press will activate Google Assistant, which we found, with the help of the built-in mic, picked our voice up very consistently. However, while last year's edition was a little too small and stiff to twist, the Connected 2018 goes the other way. Cycling through menus with the crown takes a while to get used to, due to the high sensitivity, though this is still a neat way to get around if you're looking to avoid smudging the display. And, spoiler alert, this doesn't take kindly to fingerprints. However, all things considered, the design of this watch is a roaring success. Build quality is just as strong as before, while the thinner, lighter approach makes it more accessible to different wrist sizes. In our view, it could very well be the best looking smartwatch for men - especially those who want the look of a regular watch. Both the features and operating system have been given big overhauls from Emporio's first smartwatch, and it makes the experience a lot fuller; this Connected model is much more than a pretty face. As we mentioned, contactless payment support is now available through Google Pay, while GPS and the heart rate monitor are ready to help out on the activity tracking front. This now runs through the refreshed Google Fit, which also provides a much better on-wrist experience than before - access to heart data, workout history and more that we'll come on to below. Another thing that's been refreshed is Wear OS itself, which, despite being prone to the odd hiccup, has improved considerably over the past year. It's still not enough to put it on par with watchOS, but the gap is smaller. And, unfortunately, something that could have helped bridge that even further is the internal processor, which is still the ageing Snapdragon 2100, despite the 3100 chipset sitting in some slightly newer watches. We're not saying it would improve the experience dramatically, since it would mainly improve energy efficiency, but the lags when switching watch faces, opening apps or trawling through notifications would almost certainly be eliminated, too. We're glad the stylish watch faces have returned, too. This allows you to customize the color of each and, say, turn a drab analogue face into a vibrant and creative digital one in under a minute, before saving it in order to quickly swap out in the future. Or, you can now change it directly from the Wear OS app - even on iPhone, as we were testing from. While the Wear OS iPhone app previously was a dead-end portal to simply check if your watch was connected, it's now considerably fuller, showing you faces, Google Fit data (rejoice, you don't need yet another separate app) and ways to toggle notification, calendar and Google Assistant settings. It might feel strange making the Emporio Armani watch part of your daily activity, but the new built-in GPS and heart rate monitor make this a very real possibility. Whether you take full advantage of it, obviously, is up to you, but it feels right that standard smartwatch features like this are now packed in, given the asking price. And generally, we've been impressed with the Google Fit experience on the wrist. Workouts, Guided Breathing, Move Minutes, Heart Points, steps and calories are all easy to view, and even if it is frustrating you can't view exercise history on the Wear OS for iPhone app, it's serious leg up from the first generation. We can now comfortably say this is in line with the basic activity tracking experience provided by Fitbit, Apple and Samsung. Despite the sensor additions being a good look on paper, though, we've had more than few issues when testing them out. For starters, simply locking onto the GPS didn't work - like, flat-out just didn't work on the six or seven occasions we attempted it. We've had issues with Fossil Group watches taking a long time to lock on before, but nothing this extreme. Now, obviously, this could be a sample issue - but, even if we were to get it going, we're not convinced the antenna would be any stronger at picking up a location than, for example, the Armani Exchange AX Connected. Instead, we were forced to rely on the on-board accelerometer to track distance. And, a little surprisingly, it wasn't too bad at trying to match the Garmin Forerunner 935 for accuracy. Using the example below, the 3.38 mile distance set by the Garmin was only over-reported by around 0.2km - which, relatively speaking, isn't too bad. Your location will obviously be picked up if the watch tethers from your phone's GPS, as well, but, whichever way you try and get around potential GPS issues, it really isn't ideal for those who have plans to run without their connected device present. Now, in terms of heart rate, we found the Emporio to be more on the money - again, something that can't be said for all the fashion-first smartwatches in Fossil Group's family. After a number of test runs against the Fitbit Versa, it always seemed to indicate that our average bpm was within a few beats of the other watch, though the two did vary sometimes over the max heart rate figure. One run, for example, the Connected sat a considerable distance off the Versa's reading during separate ramps up in intensity. In our mind, if you want a decent look at your heart metrics throughout the day and during exercise, this should suffice. However, the accuracy you receive is likely very dependent on getting the right fit on that stainless steel band - so take note. And that brings us nicely to another point, one we've mentioned countless times in reviews: exercising with a stainless steel strap is awful. As your wrist expands during workouts, this makes the watch seriously uncomfortable, let alone just being heavy to carry and making HR inaccuracies more likely. It's a good thing Emporio now packs in a separate non-metal strap with some models of the watch, but it just feels like this should be standard across all variations, else it risks advertising itself as an activity-capable watch that, in practice, isn't actually very capable at all. Battery life, as ever, depends on how you're using the device. However, in our experience, the Connected will typically last just over a day. If you're using it for base-level stuff, such as checking notifications and making payments, and you're not using that heart rate monitor or GPS, this can definitely stretch out a little further. But, let's be honest, it's not great when compared to other smartwatches. For those who want to make use of that always-on screen with mid-level use, you may even struggle to make it through a working day, as we found a couple of times. And, again, it's in this area where the watch could have benefitted from the Snapdragon 3100 processor, much like the Fossil Sport. We're not convinced it would have turned this into a true contender for the title of best smartwatch, but eking another day of life out would have been a big tick in Emporio's favour. For the charging itself, you'll be using a magnetic puck that connects to the underside of the watch. We've experienced no problems with the magnet staying in place, and it's a much more preferable solution to the plug-in style employed by other companies. The Emporio Armani Connected is lovely - lovelier the second time around, after a mixed debut. The design is still the focal point of this smartwatch, and rightly so, but it's now backed up by a gamut of smartwatch features, such as Google Pay and GPS, and powered by the improving Wear OS. However, with the space moving on so quickly, this is a device that feels one step behind; issues that have been solved through this generation were already conquered by rivals a year before, and it makes the problems regarding the processor and battery even more glaring. There's plenty to like, but this isn't a watch that can seriously challenge tech's household names.